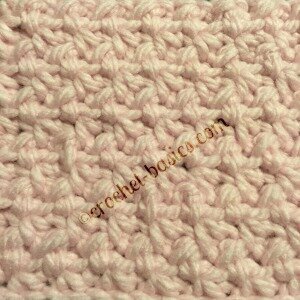 The crochet glover stitch is a really fun stitch to make. It has a nice texture that creates a little bit stiffer fabric. When you have it all completed it looks a little different depending on the angle that you’re looking at it. From one direction, it looks like there is a dashed line through your stitches. From another direction, it looks like a fun, bumpy texture with slanted stitches. You might see it completely differently. In this stitch you will be pulling through 4 loops at once and also working in the front loops on some rows. Because of this, it is considered an intermediate stitch. With some practice you'll get the hang of it and I'm sure you'll have no problem at all. If you're ready, let's give it a try and make a swatch. Insert hook into the 2nd chain from the hook and pull up a loop. Yo and pull through all 4 loops. There should be 2 chains at the end of your row. 1 to complete the stitch and 1 for the turning chain. Insert hook into the front loop only of next stitch, pull up loop. The last step of the last stitch will be worked into the turning chain. Repeat Row 2, 10 more times, for a total of 12 rows. In your own projects, you will repeat Row 2 until you reach your desired length. That's all there is to this great stitch. Look at it from different angles and see what you think. I'm sure you'll be using it in lots of your coming projects. I'd love to heart about what you're working on. So, don't forget to stop back and tell me all about it.